Last New Year's Eve, I made a resolution to pack my children's lunches for school. From the first day they returned to school in January until today when they're in summer camp at the YMCA, I have packed their lunches every day without fail. As a lunch-packing mom, I'm sure that you know how frustrating it can be to figure out what to pack and how to pack it. I've opened up lunch boxes at the end of the day to find that hardly anything had been touched. That means it's time to rethink what is being packed. 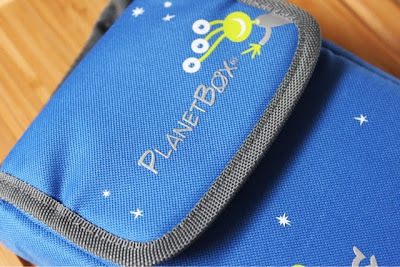 One company that is trying to help all those haggard parents out there is PlanetBox. The company provided me with this product, PlanetBox Shuffle, to review. What is PlanetBox? According to their web site, a PlanetBox is "part bento box, part TV dinner tray, our segmented containers are the best way to pack delicious, no waste meals for school, work, or on the go." There are three different types of boxes: the Launch (large), the Rover (medium), and the Shuttle (small, snack-size). 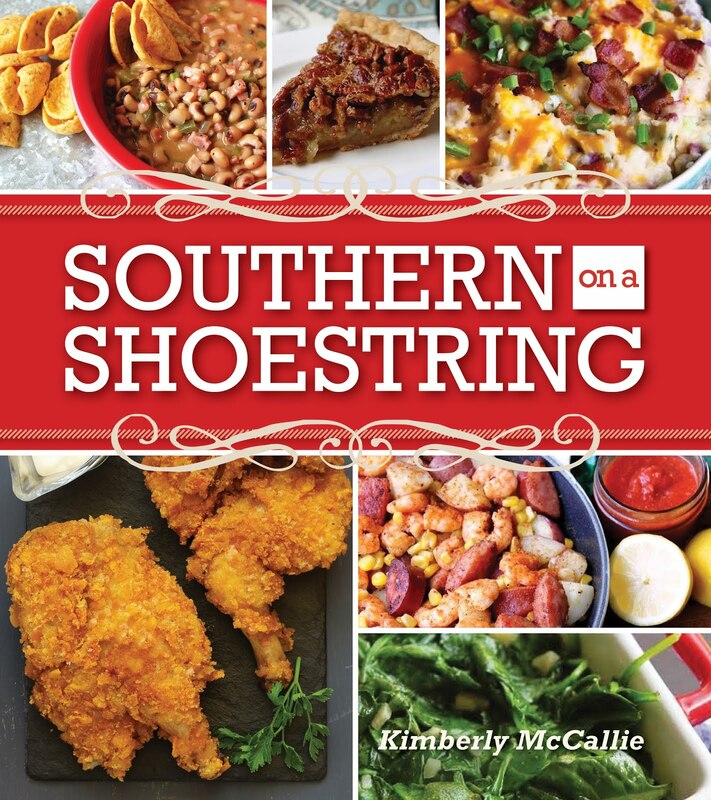 You can check out all of the details here. The Shuttle I received came with an aliens carrying bag and magnet set. The carrying bag is lightly insulated. There are several sets to choose from or you can purchase the box without the carrying bag. As you can see from the photo below, the box is quite attractive without the magnets. Of course, as soon as my 8-year-old saw the magnets and carrying bag, he claimed them as his own. 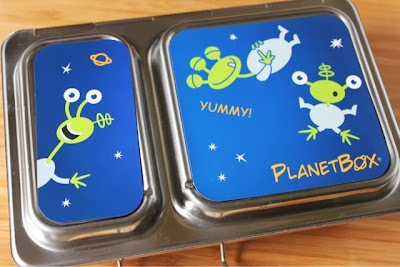 The complete set comes with the carrying bag, magnets, and the tall dipper. The dipper is perfect for salad dressing or, my favorite, caramel sauce for my apples. The large compartment can easily hold a sandwich, wrap, or salad while the smaller compartment is perfect for a side of fruit or veggies. 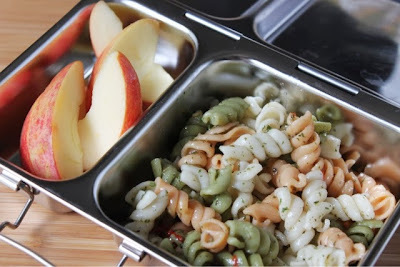 While my son wants to take the Shuttle back to school when he returns, I've been sneaking around and using it for my own snacks and lunch this summer. 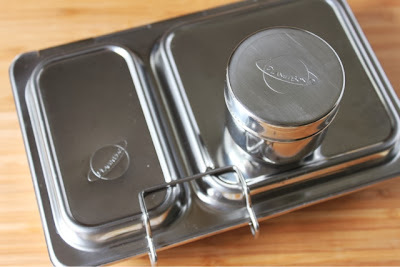 I love the idea of using a product that is sturdy and can be reused indefinitely. To wash the box, I quickly washed in warm, soapy water and wiped dry. The stainless steel construction kept the food perfectly chilled as I put my Shuttle in the refrigerator until I was ready to eat. If you're making changes in your life that involve producing less waste and you want a product that can hold up to regular use, then a product from PlanetBox may be the investment for you. Disclaimer: PlanetBox provided me with the review product; however, the opinion expressed here is my own.